The Letter of Intent Agreement is intended for two parties who intend to enter into a contract. This Letter of Intent is not a binding contract, it is meant for the parties to ensure they have a clear understanding of what a subsequent contract entails and helps clarify understanding of the potential agreement. has been different requiring me to pull together different groups of subcontractors for those parts of the project that I don’t do myself, sometimes a real logistical nightmare for a small business owner.......with this new product, I was able to put together a professional proposal in 1/2 the time." This Letter of Intent Agreement is included in editable Word format that can be customized in Word or by using the included Wizard software. How do you write a Letter of Intent Agreement document? Company Name "Party A" AND Company Name "Party B". Postal Code Zip or Postal Code. This document, in and of itself, does not represent an enforceable legal contract. Insert summary of terms for letter of intent. Insert consideration/compensation or financial terms. Upon execution of this letter of intent, parties will allow Insert whether the terms include an examination of financial, accounting, legal, historical or intellectual property information, including any business records, communication, disclosures, contracts or any other legal documents. Any information obtained during this period shall be bound by the terms of a Confidentiality Agreement executed by the parties, dated Date (the "Confidentiality Agreement"). The parties pledge full cooperation in order to complete the due diligence and review period without unreasonable delay. All terms and conditions contained within the proposed transaction will be fully contained within the Purchase Agreement. Neither party shall be bound by any written or oral statements, whether made by the respective parties or their designated agents, employees or assigns that concern the Purchase Agreement that may arise out of discussion or negotiation. Parties agree to a closing date of Insert Closing Date, which both parties shall agree to be the date in which both Due Diligence and Review must be complete and all Terms and Conditions contained within the Purchase Agreement. All terms are subject to the parties continuing to conduct their business in the ordinary course and having no material adverse change in business, condition, finances, litigation, prospects, governmental action or any material change not disclosed at the time of the closing date. Insert Business Continuity and Employment terms here. Parties agree that TIME IS OF THE ESSENCE and both shall use all reasonable efforts to complete the Due Diligence and Review period and to sign the Purchase Agreement on or before Insert Signature Date and subsequently to close the transaction as promptly as practicable thereafter. Parties shall be responsible for their own expenses incident to this letter of intent, the Review and Due Diligence period, the Purchase Agreement and all related transaction costs except where explicitly noted in the Purchase Agreement. Neither party shall make any public announcement(s) of the proposed transaction contemplated within this letter, or of the execution of the Purchase Agreement without the express written approval of the other party. The above shall not restrict in any way either party's ability to communicate information concerning this letter of intent, the Due Diligence and Review period, the transactions contemplated, and work product or information used by either party, its agents or designees - including information relevant to third parties whose consent shall be required in connection with the transaction(s) contemplated by this letter of intent. Both parties agree that for a period of Insert Days Here that their officers, directors, employees, agents or assigns shall not solicit, initiate, encourage, whether directly or indirectly, or accept any offer or proposal, regarding a statement summary of what this letter is about, e. Acquisition by any person or entity other than the parties listed in this letter of intent, including, without limitation, any purchase or disposition of assets, mergers, sale of stock or securities, equity or any other action that is not considered to be normal and ordinary and within the ordinary course of business conducted. Each party acknowledges and agrees that due to the nature of the information exchanged in this letter of intent and the period of time up until the Closing Date, there can be no adequate remedy of law for any breach of its obligations hereunder, which breach may result in irreparable harm. Upon any such breach or any threat thereof, the aggrieved party shall be entitled to appropriate equitable relief in addition to whatever remedies it might have at law. In the event that any of the provisions of this Agreement shall be held by a court to be overbroad as to scope, such provision or provisions shall be limited or eliminated to the minimum extent necessary so that this Agreement shall otherwise remain compatible with the law as it shall appear. This Agreement supersedes all prior discussions and writings and constitutes the entire agreement between the parties with respect to the subject matter hereof. The prevailing party in any action to enforce this Agreement shall be entitled to costs and attorneys' fees. This Agreement shall be binding upon and inure to the benefit of both parties and their respective successors and assigns. Neither party may assign any of its obligations under this Agreement without prior written consent. 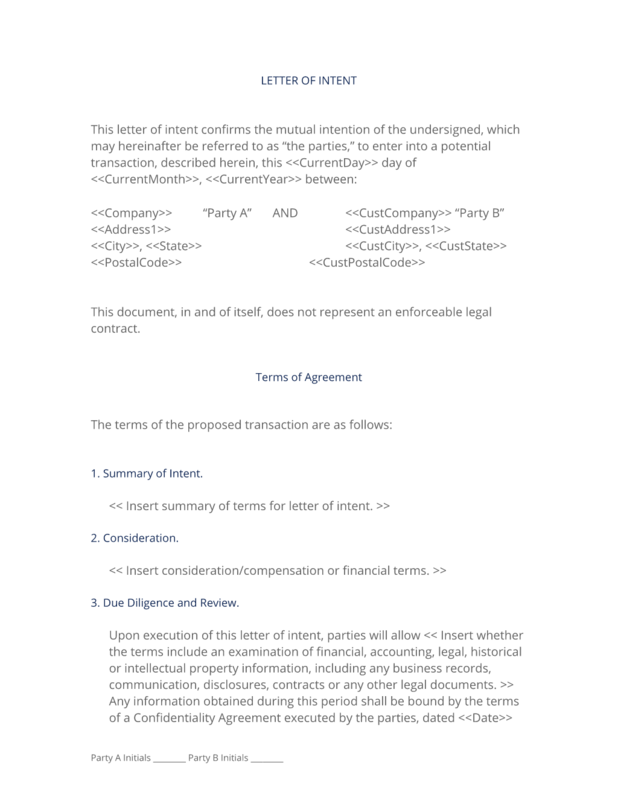 The complete Letter of Intent Agreement - with the actual formatting and layout - is available in this Contract Pack.